London owes its origins to the Romans  we have no evidence of a structured settlement there until after the second Roman invasion of AD 43. The city has had almost continuous occupation since that date. Continuous occupation usually leads to a steady rise in the ground level. In London, the town the Romans knew lies between three and six metres below the level of our pavements. It was both an administrative centre and a market, and was set out on a relatively regular grid of streets, encircled by a defensive wall after AD 61. Around AD 50, the Romans constructed a timber bridge across the Thames (although they may have had an earlier bridge at another site)  the first London Bridge. The spot chosen, 60m downstream from the present bridge, was at the tidal limit of the river and offered solid gravel banks on either side. Roads from the south converged on this point. The Romans saw the economic potential of the site of London. The Thames gave it access to the open sea and trade routes, and provided a defensive barrier. Bridging the river was an essential part of Roman Britain's transport network, both commercial and military. The Thames valley, an Ice Age creation, cuts across southern England. It was probably choice ground for stone-age man, though the river would have looked quite different to the way it did when the Romans arrived, and the way it does now. In 3500 BC the Thames would have been wider and shallower, full of marshland and mud flats. The site on which London was eventually founded, 40 miles from the sea, would have been an attractive place for a settlement. For one thing, if you were coming up the river, it was one of the first sites on the north bank where there was a large area of firm ground close to the life-giving water. It may also have been the furthest point to which sea-going vessels could navigate at that time. The Romans came in 54 BC. Led by Julius Caesar, they landed on the Kent coast with five legions and 2,000 cavalry, and marched north. Caesar was opposed by Cassivellaunus, who decided to fight the Romans at the Thames. The Romans took the Britons' river crossing-point by storm and the Britons fled. We do not know where the battle took place but Caesar later wrote that "the Thames can be forded only at one place and that with difficulty" (see Gallic Wars by Julius Caesar). We assume that the crossing was located where there was gravel  perhaps at Brentford. Caesar's invasion was only a raid and he left Britain later the same year. There was not yet any significant settlement at London and the Romans had yet to construct their timber bridge there. It is possible that Caesar left a pontoon bridge at the point where he crossed the Thames but we don't know. One consequence of this first invasion is that Britain began to trade with the Roman armies along the Rhine in Germany, and continued to do so after the Romans left. The British traded wool, grain, leather, oysters, hunting dogs, lead, silver, gold and slaves in return for a number of Mediterranean luxuries. These included olive oil, grain, salt, preserved fish and fruit, and ivory. This trade was centred on the Thames Estuary, which gave sea-going shipping access to inland areas. It is thought that the settlement (unstructured) that became London began to develop in this period  after Caesar's invasion and before the second invasion, almost a hundred years later. When they did come back, the Romans would be the first to build towns in Britain. The second invasion was led by Claudius and took place in AD 43. The Britons again used the Thames as a defensive line and again were beaten. 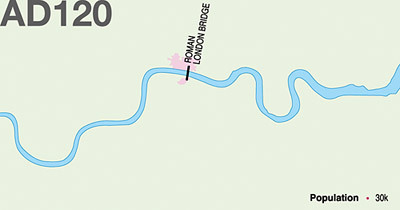 The Romans had come to stay, and the site of London, because it had access to the sea and because the Romans were able to bridge the Thames at this point, became the centre of the network of roads they went on to build. The Roman Bridge is thought to have been constructed in timber in AD 50. In AD 61, London, along with Colchester and St Albans, was destroyed during Boudicca's revolt. It was rebuilt, and this time the Romans constructed a defensive wall around it, parts of which can still be seen today. The most easily accessible spot to see it is beside the Tower of London. The Roman wall was nearly three miles long, 4.5m high and some 2.4m thick. It is the line of this enclosing wall that defines the area we know as the City of London (or the 'Square Mile'). The new London soon became the biggest city in Britain. By AD 250 it had become the fifth largest Roman settlement north of the Alps. Trade grew and the focus of trade began to shift from foreign goods (supplied from Europe and the Mediterranean) to local goods sourced along the British coast, such as pottery from Dorset and ragstone from Kent. The Romans built four ports in London  Billingsgate, Queenhithe, Dowgate (at the mouth of the river Walbrook) and Bridewell (at the mouth of the river Fleet). This was the beginning of a national transport network for bulk goods.